The laying of the 'foundation of the Pavilion in the East Colonnade' (the future Queen Mary's Court), and work on the 'foundations of the Dormitories on the East side of that Court' was ordered on 28 January 1702, just six weeks before the death of King William III (Wren Society, VI, p. 43). In the 'Abstract of the Estimate for finishing Greenwich Hospital' presented on 27 April 1704 to the new Commission appointed by Queen Anne, a sum of over £23,000 is given for the cost of erecting 'the Building opposite to the Hall upon ye foundation now laid' (ibid., p. 46). However, no further work was done on Queen Mary's Court until the early summer of 1735, when the foundations were reopened and work commenced on Ripley's revised designs. John James had been joint Clerk of Works with Hawksmoor since 1718. He had sole charge as Clerk when Hawksmoor relinquished his post in 1735. This drawing and [12/13] bear James's handwriting (for example the 'f' with a long descender and counter-clockwise loop), his style of dimensioning with colons or dots between the numbers, and his paralleled ruled scale bar (see also his annotations on [10/1], a record elevation of the King Charles II Building). 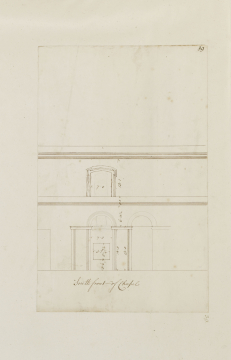 On the evidence of these two working drawings, it would be reasonable to attribute the design of the courtyard elevation of the chapel to James. This design for the detailing of the upper wall elevations is likely to date shortly before the start of work on the chapel. The drawing provides dimensions for the main elements of the upper two storeys that would have informed an overall estimate of building costs, and dimensions for the openings and for a nearly square panel within the principal window. The windows at main-floor level are Palladian-style versions of the round-arched windows at this level on the south side of the hall range. For the upper windows James simply copied Hawksmoor's on the south side.